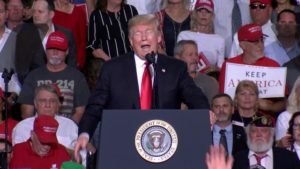 Trump Takes Martha McSally, Doug Ducey and other Republican Candidates through the Alt-Right Looking Glass at a rally in Mesa. Once upon a time, mainstream politicians would stay far away from politicians that have been endorsed by the Ku Klux Klan or those who have taken pictures with white supremacists. That was the era before Donald Trump. Now, as most Republican candidates (including Martha McSally and Doug Ducey) in Arizona fall over themselves to meet him at a rally in Mesa, it does not appear to matter that he was. Even in Arizona, this behavior appears to have no consequences as Doug Ducey took a picture with known white supremacists earlier this year. In another time (over two years ago), that might have dealt a deathblow to his reelection campaign. Not today and it is a shame because it teaches our children some wrong lessons about the value of a person’s character in our public servants. Trump, The KKK-endorsed candidate and popular vote loser, spent October 19, 2018, in Arizona on a campaign swing to help Republican Senate candidate Martha McSally after her abysmal debate performance on October 15. True to form, he spent his time at a rally in Mesa wowing the crowd that traveled hours to see him, McSally, and the other state Republican candidates with outlandish remarks complementing Republicans for policies that they were not responsible for and accusing Democrats of acts either untrue or ones that Republicans or their supporters are guilty of. It is almost as if they were looking through the Alt-Right Looking Glass and mistaking the Democrats for themselves. During the rally, the President and Governor Ducey credited the Republicans for the current good state of the economy. History records that the economic recovery and the march to low unemployment all started early during the Obama Administration and the expansion started during that Presidency has continued to this day. During the rally, the President said that the Democrats create mobs. What mobs? Is he mistaking his own rallies where fights have occurred, where he denigrates people or where he, like yesterday in a rally in Montana complemented the Congressman there for assaulting a reporter? During the rally, the President claimed that the Democrats and their allies are responsible for the caravan of Honduran refugees making their way through Latin America towards the US border. At the rally and earlier in the day, he claimed that this caravan was filled with “hardened criminals.” He offered no proof about Democratic involvement or how he knew some were hardened criminals. It is no surprise, as he lies about seven times a day. During the rally, the President, echoing McSally from Monday, claimed that Representative Sinema advocated treason for an offhand one-sentence remark to a bombastic radio talk show host in 2003. That is “rich” considering this President’s campaign team and Russian intelligence assets have been indicted for lying, money laundering, and working with a foreign power to influence the 2016 Presidential election. This President is also a likely unindicted co-conspirator in the pending investigation of his former personal attorney. How a military veteran like McSally could be on the stage with someone endorsed by the Ku Klux Klan and who, along with his family and campaign associates, may have engaged in treasonous and illegal behavior to benefit themselves and change the outcome of a free and democratic election speaks more of her lack of character than a one-sentence off the cuff remark made in 2003 by Kyrsten Sinema long before she entered elected public service. When the President or his allies make these comments about Democrats not being good for the economy, not advocating law and order, and inciting violent mobs, they are just staring in the mirror and seeing themselves. They are the ones that create mobs. They are the ones that incite violence against others like journalists. They are the ones that are tribal and ethnocentric. They are the ones that preach the big lies. They are the ones that are being convicted left and right of crimes against our country. They are the ones that are destroying the country. They are the ones that do not know how to govern. They are the ones that say the Obama economy is theirs. It is time for Democrats to rally and turnout this election season and 2020. There is no electoral college to give Republicans victory this year. Remember that the Democrats actually gained seats in the House and Senate in 2016 and 2017 while winning the popular vote. The people who support the lies and hateful messages coming from this President are the true minority and it is time for the majority to turn out and rescue our country in 2018 and 2020. Let it start in Arizona by electing Kyrsten Sinema as our next Senator, David Garcia as our next Governor, and the other qualified Democrats seeking office this November.